Just a quick post today in the off-chance that I might save someone the frustration of wondering which industry category to choose from, or prevent them from choosing the wrong industry category (as I almost did) when configuring Google Analytics. I received an alert notification from Google the other day that recommended that my client set a distinct “Industry Category” within the >Property Settings of their Google Analytics account. So, what does that even mean and why would it be a useful thing to do? And more importantly, which category should I choose? The categories themselves are pretty generic and my first instinct was to choose “Retail” since Penelope’s shops are all physical retail store locations. But “Retail” wasn’t an option (of course) and none of the other generic selections made any real sense either. “Shopping” was close. I could have make a case for “Business” as an option. And, of course, “Other” was available as a selection. Which to choose?! Obviously, I want any analytics analyses to be as accurate as possible, so I want to make sure to pick the right one. Then I found this list of Google’s “Topics used for personalized ads” categories, which show a deep hierarchy of all of those exact same analytics categories, but with more granularity. From this list it was apparent that >Food & Drink was the correct choice since: Food & Drink>Food>Gourmet & Specialty Foods was the spot-on description of what F. Oliver’s provides. Google’s unhelpful and super-generic answer is that it helps, “enable richer features in Google Analytics.” Yeah, but which features? The answer appears to be benchmarking. By selecting an industry-vertical category that most closely matches your own, you can see how your site traffic compares to others in a similar space. The benchmarking report compares your site’s visits, page views, bounce rate, average time on site, etc. to the category you chose, plus you can narrow it down by geography and acquisition channel as well. As you can see from the screenshot, we’re being compared to 81 other web properties contributing to this same benchmark, e.g. other Google Analytics accounts that specifically chose “Gourmet & Specialty Foods” as their category as we did. 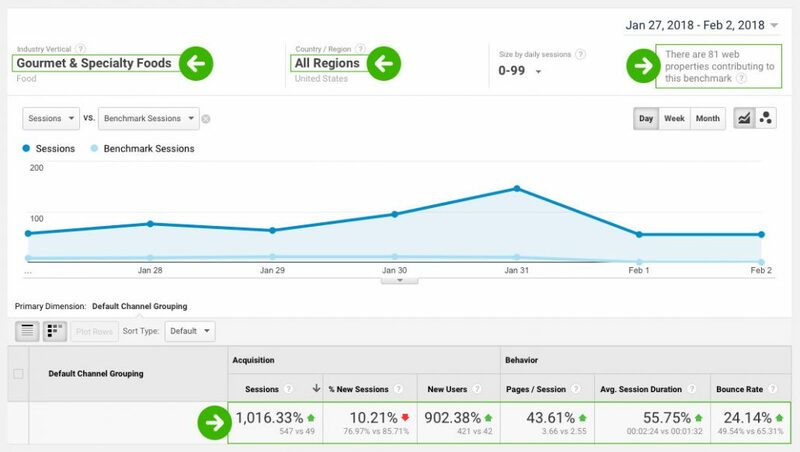 I’m not sure how useful or actionable any of these numbers are, but they are fun to look at and give you a birds-eye view of how your site is performing compared to your peers. You may see, for example, that you’re killing it in organic search with super-impressive numbers but that you’re falling short in social media in comparison to others. At a high level, you might want to re-evaluate your social marketing strategy. Perhaps you are doing well in social but just not properly using Google Analytics campaign parameters to track them properly. Perhaps you’re simply not putting as much of an effort into social as you should be (compared to others) and it’s time to re-think that strategy, e.g., “Oh, our demographic doesn’t use Instagram.” Yeah? Think again. Again, take these benchmarking statistics with a grain of salt, but at least pay attention to those benchmarks where you are performing significantly worse and ask yourself, why?